Ontario Premier-designate Doug Ford says he stands "shoulder to shoulder" with Prime Minister Justin Trudeau. Premier-designate Doug Ford, who met with industry representatives today to discuss NAFTA negotiations, says "name-calling" won't help resolve disagreements on trade between the United States and Canada. The meeting came just days after Ford said he stands "shoulder to shoulder" with Prime Minister Justin Trudeau who was the subject of a Twitter tirade from U.S. President Donald Trump over the weekend. Trump called Trudeau "weak and dishonest" after the G7 summit in Quebec on Sunday, apparently angered over comments the prime minister made during a press conference when he objected to American tariffs imposed on steel and aluminum last month. Ontario's newly elected premier-designate says while he understands U.S. President Donald Trump is sticking up for his country in recent remarks criticizing Canada and the prime minister, attacks on allies won't help complex trade negotiations. "Nothing is beneficial from getting into an argument with each other, it just doesn't benefit companies, it doesn't benefit people," Ford told reporters on Wednesday. "Are we going to have some differences internally within the family per se? I'm sure we'll have a few bumps. "When it comes about international trade and working with the United States and Mexico, make no mistake about it ... we're going to stand side by side." Ford says the American tariffs will hurt jobs on both sides of the border and should be lifted. He said that while he disagrees with the federal government on issues like carbon pricing, his top priority is protecting jobs for Ontario workers and reiterated that he would stand behind Trudeau. 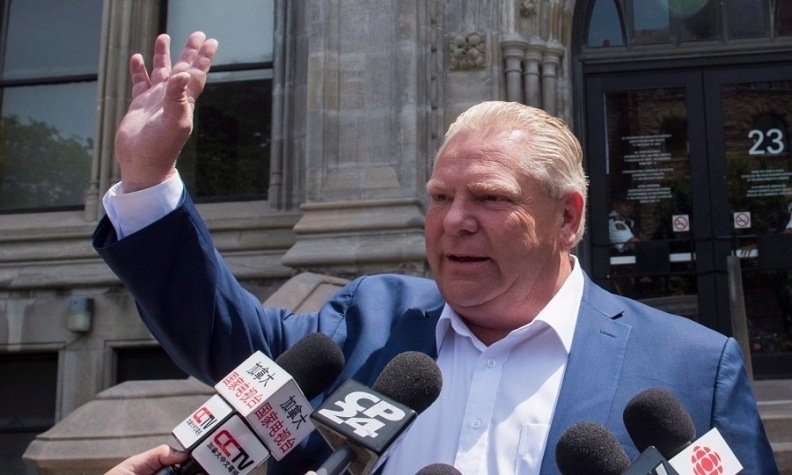 Ford said Sunday that his top priority is to protect jobs in Ontario, including those of steel and aluminum workers in the province. Trump has also taken issue with Canada's supply management system for dairy farmers and threatened to imposed 25 per cent tariffs on auto imports from Canada, a move that would hurt Ontario's manufacturing sector. On Thursday, Ford will sit down with Foreign Affairs Minister Chrystia Freeland and Canadian ambassador to the United States David MacNaughton for a briefing on the NAFTAtalks. "I can tell you on the trade deal south of the border, we stand shoulder to shoulder with the prime minister and our federal counterparts," Ford said Sunday. "My number one priority is to protect jobs in Ontario, especially protect the steel workers, aluminum workers." Ford also told reporters that he would be sitting down with federal officials to discuss the trade deal. "We're going to stand united," he said. "I know all provinces should be standing united with our federal counterparts and we'll deal with that."